No more stinging eyes and no more tears thanks to this great chopper. 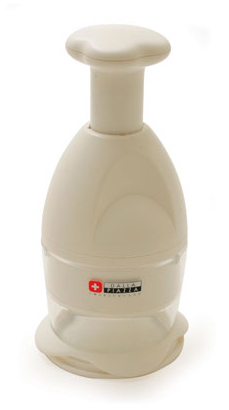 It is a Swiss made kitchen gadget featuring superior materials and craftsmanship. The FreshChop is designed with a modern look and functional style. Use it to chop onions, garlic, carrots, celery, nuts and more. It is made of durable white ABS plastic and has an integrated chopping pad so it avoids soiling an extra cutting board. All of your food is chopped quickly and neatly inside the clear storage container. Measurements on the side let you know exactly how much you have. The FreshChop has a capacity of up to 8oz. and a non-skid base for easy usage. Just push down to chop. The stainless steel blades rotate one third of a turn every time you press down. This ensures even chopping each and every time. This great chopper even includes a lid that caps the container contents for easy storage in the fridge. When not in use, the cap attaches to the bottom of the unit for easy storage. No more lost lids. It is easy to take apart for cleaning and totally dishwasher safe. Gift boxed. Five-year warranty. Cooks are forever looking for easier, quicker ways to accomplish kitchen tasks. Chopping is probably the most frequent cooking direction in any recipe. It is made easier, cleaner and quicker with this sturdy chopper. The FreshChop quickly and easily chops your favorite foods. Simply press down a few times for coarsely chopped pieces or several times for a finer dice. It is perfect for onions, garlic, carrots, potatoes, and even nuts. The central plunger allows for easy one-handed use. It features all stainless steel blades and an integrated scraper that actually cleans the bowl as you chop. Dalla Piazza products are imported in North America exclusively through Swissmar, and are sold in both high-end specialty retail shops and upscale department stores, as well as supermarkets and large distribution stores. Many of the products have specially added and patented features, which make them stand out from the rest of the market, and come with a five year warranty by Enrico Dalla Piazza. Each Dalla Piazza product is manufactured in the traditions and the philosophies of half a century ago and the company will continue to meet the discerning tastes of a sophisticated clientele who appreciate these visions. Order Yours Today! Dalla Piazza FreshChop Onion Chopper - High quality materials and craftsmanship make this Swiss made kitchen gadget a must have. A great accessory for anyone that enjoys cooking. Great for nuts, chocolate veggies and more. This product has been discontinued by the importer. For this reason, we are unable to determine the answer to your question.